Love em’ or hate em’ no one can deny the pure entertainment value of a good old-fashioned dust-up. 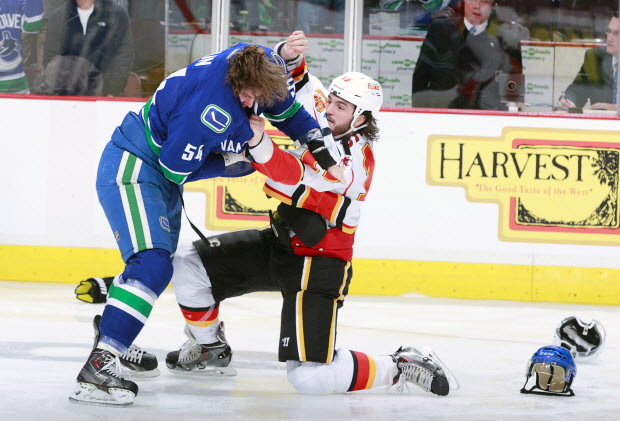 Young and old, alike, left their seats on Saturday to take in a few minutes of rock em’- sock em’ hockey as the Canucks and Flames unexpectedly erupted into a brawl seconds after the opening faceoff. Was it neccesary? Probably not. Did it make the league and the teams look bad? Probably. But we all know this league isn’t a morality convention – it’s a business. And until something can usurp the popularity of fighting, we’re sure to see a few more of these situations in the future. The Canucks have struggled all year to find an identity that works for them and as of late, the identity seems to be that of the tough guy. Players like Tom Sestito and Zack Kassian have climbed to the top of the penalty minute leader rankings and the Nucks’ penalty killing has been put through the ringer. Only time will tell if this identity sticks but it isn’t the first time we’ve seen the boys frustrations boil over into chaos. 5) Vancouver vs Edmonton: A regular season game with no real meaning, this brawl erupted in the closing minutes out of Oiler frustration. Highlighted by a Gagner-Kesler tilt, this one involved some unexpected combatants. 4) Vancouver vs New York: A classic and tense conflict that foreshadowed a heated Stanley Cup Finals. Mike Keenan and Pat Quinn may have been the most heated people in the rink. 3) Vancouver vs Colorado: Forever a black mark on the Canuck franchise, this night infamously ended the career of Steve Moore. Todd Bertuzzi seeks retribution for his fallen comrade Markus Naslund, through a brutal sucker-punch and an ensuing pile-on. 2) Vancouver vs Boston: The follow-up to the heated series a year prior, this game had been marked on both teams’ calendar for months. An entertaining and spirited brawl that reignited this rivalry and helped keep it burning to this day. On a sidenote, I loathe these Boston commentators – note their undying bias. 1) Vancouver vs Chicago: The moment that started one of Vancouver`s great modern rivalries. This one had it all: the Burrows hair pull, Ben Eager fighting Kevin Bieksa, Dustin Byfuglien punching Luongo in the face- just classic. Thank you for this post. I thoroughly enjoyed it. LOL Man, I love Pat Quinn. He was the last “players’ coach” for the Canucks. Torts has brought that all back! Also, those Boston announcers went to the Mike Milbury school for the blind. How did Horton “own” Weise? Oh my god, Jack Edwards (boston’s play-by-play guy) is a joke. Youtube him- he’s the most blunt homer in the league. At least John Garret doesn’t twist everything to make it seem like the Canucks are always in the right. Ya it was fun looking through all the old brawls, good trip down memory lane. Except Bertuzzi. That was just depressing. While not a brawl, somewhat surprised the three sequential faceoff-then-fights didn’t at least get honourable mention.